New York, New York, home of the Spiderman. 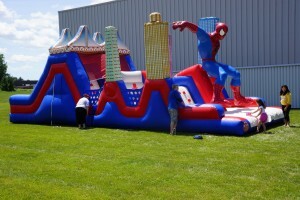 Our New York Spiderman skyline inflatable has it all. Kids and adults alike will feel they are webbing from one building to another as they run, climb, slide and jump throughout the buildings. This Spiderman inflatable is very colorful and exciting has no extremely tough obstacles – can be used by virtually all ages including adults. The obstacle consist of loop covered wedges, climbing walls , tunnels, slide , over and under walls etc. Sure to bring excitement to all! !